Date: 06/20/2018 7:00 p.m. - 8:00 p.m.
Plymouth residents learning CPR at a Heart Safe Plymouth training. 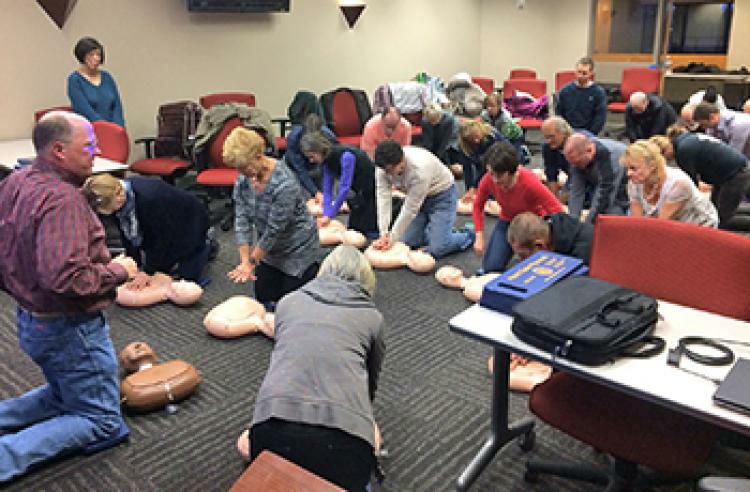 These free Heart Safe Plymouth trainings teach bystander CPR and AED use to the public. Registration is required. Due to the popularity of the training sessions and limited space, early registration is encouraged. The one-hour training sessions are open to teenagers and adults who are interested in learning to help save lives. Participants can learn hands-only CPR, which teaches chest compressions without mouth-to-mouth breaths, as well as the use of an AED. Heart Safe Plymouth is a partnership between the City of Plymouth Public Safety Department and Rotary Club of Plymouth.